P1299. 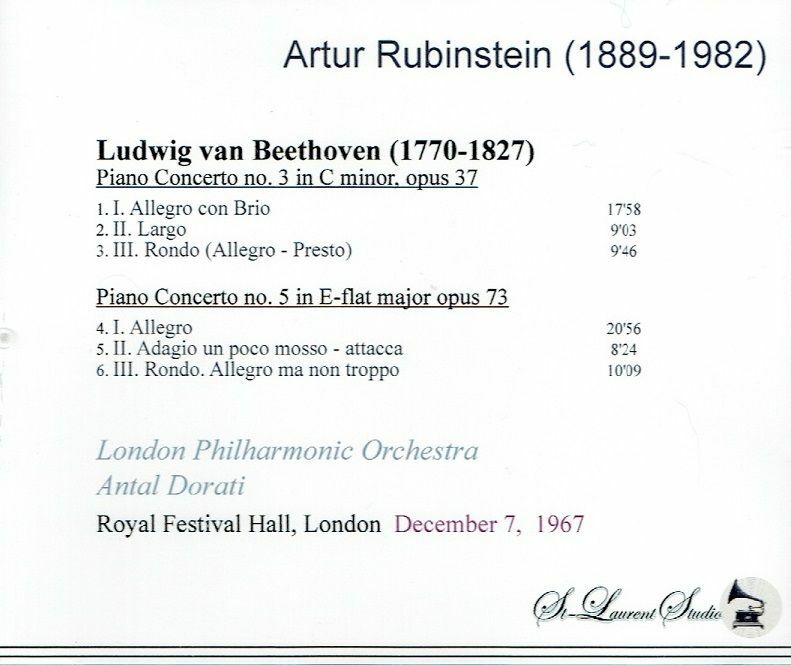 ARTHUR RUBINSTEIN, w.Antal Dorati Cond. London Phil. : Piano Concerto #3 in c; 'Emperor' Piano Concerto #5 in E-flat (both Beethoven). (Canada) St Laurent Studio YSL T-796, Live Performance, 7 Dec., 1967. Transfers by Yves St Laurent. 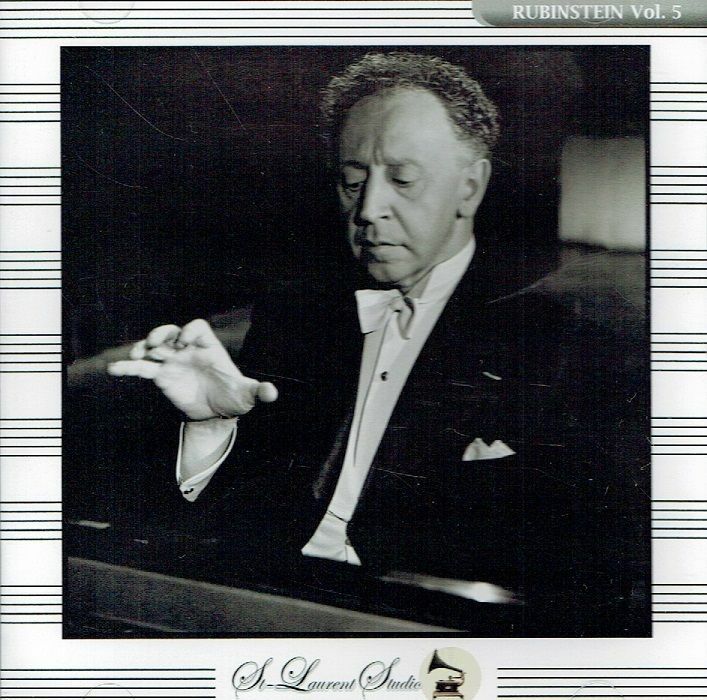 “Rubinstein believed that a foremost danger for young pianists is to practice too much. 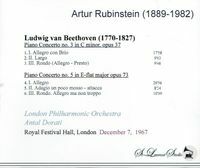 Rubinstein regularly advised that young pianists should practice no more than three hours a day. ‘I was born very, very lazy and I don't always practice very long’, he said, ‘but I must say, in my defense, that it is not so good, in a musical way, to overpractice. When you do, the music seems to come out of your pocket. If you play with a feeling of 'Oh, I know this,' you play without that little drop of fresh blood that is necessary – and the audience feels it’. Of his own practice methods, he said, ‘At every concert I leave a lot to the moment. I must have the unexpected, the unforeseen. I want to risk, to dare. I want to be surprised by what comes out. I want to enjoy it more than the audience. That way the music can bloom anew. It's like making love. The act is always the same, but each time it's different’. "Antal Dorati, an internationally known conductor who championed the music of Bartok and who led the National Symphony in Washington from 1970 to 1977, was a warm, hearty conductor, not so concerned with refined interpretive detail as with vital, sensible statements of the music at hand. Aside from his wide-ranging career in concert life, he made more than 500 recordings, many of them sonic showpieces, which further spread his fame. Mr. Dorati was born in Budapest. At the age of 14 he entered the Liszt Academy, where his teachers included Bela Bartok and Zoltan Kodaly. Upon his graduation at the age of 18 he became a coach at the Budapest Royal Opera, where he made his conducting debut in 1924. In 1928 he became Fritz Busch's assistant at the Dresden Opera, and from 1929 to 1933 he was music director at the smaller Munster Opera. Although he never held another full-time operatic post, he periodically guest-conducted opera the rest of his life. Mr. Dorati's next years were devoted primarily to dance, which presumably sharpened his sense of rhythmic propulsion in music. From 1933 to 1941 he was a conductor with the Ballet Russe de Monte Carlo, touring the world with the company, and from 1941 to 1945 was music director of American Ballet Theater. Throughout this period Mr. Dorati continued his guest conducting in the symphonic repertory, making his American concert debut in 1937 with the National Symphony. After World War II he returned to the orchestral world, starting with the reconstruction of the Dallas Symphony as its music director from 1945 to 1949. He became an American citizen in 1947. After the Dallas orchestra came 11 years with the Minneapolis Symphony, during which time he also appeared frequently in Europe - principally with the London Symphony and the Philharmonia Hungarica, a West German-based ensemble of Hungarian refugees. In the early 1970's, as that orchestra's honorary president, he recorded all the Haydn symphonies with the ensemble. In the 1960s, Mr. Dorati established his residence in Switzerland and served as music director of the BBC Symphony (1963-66) and the Stockholm Philharmonic (1966-70). As music director of the National Symphony he led the inaugural concert in 1971 at the John F. Kennedy Center for the Performing Arts. He became senior conductor of the Royal Philharmonic in London in 1975, moving up to conductor laureate in 1978. His last full-time post was as music director of the Detroit Symphony from 1977 to 1981. Throughout his career, Mr. Dorati advocated a wide range of 20th-century music. Above all he prized the work of his teacher and compatriot Bartok, music for which his own gifts for strong rhythmic articulation and vivid instrumental color were particularly suited. He was also a composer himself, in an idiom that was both modernist yet accessibly melodic, and he often conducted his own large-scaled scores. His autobiography, NOTES OF SEVEN DECADES, was published in 1979."